Posted by Raymond Yee on Tuesday, December 2, 2008, at 4:53 pm. Filed under Chickenfoot, Zotero. Tagged Chickenfoot, Zotero. Follow any responses to this post with its comments RSS feed. You can post a comment or trackback from your blog. 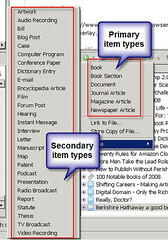 Dan Stillman sent me the following clarification: "You can also just get all item types with Zotero.ItemTypes.getTypes(), which returns an array of objects with 'id' and 'name' properties. The concept of primary and secondary might very well go away, since the menu might be changed to just show the most recently used types."